The terms dislocation and subluxation refer to the displacement of bones that form a joint. These conditions affecting the joint most often result from trauma that causes adjoining bones to no longer align with each other. A partial or incomplete dislocation is called a subluxation. In the event of a dislocation, one of the bones making up the joint is forced out of its natural alignment from excessive stretching and tearing of the joint ligaments and capsule. Muscles and tendons surrounding the joint are also usually stretched and injured to some degree. 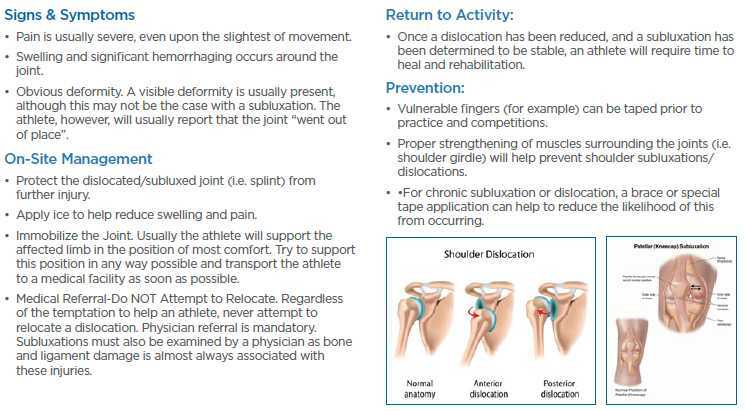 The most common dislocations and subluxations in sports occur at the shoulder, elbow, fingers, and knee.